A number of projects in the Counterparty community have been nominated for Cryptobit Game’s first ever ‘Cryptobit Awards’. Projects such as Bitcorn Crops, Mafia Wars, Age of Chains and Age of Rust, can be voted for among various categories here if you’d like to show your support for any of these projects in the community. Onwards, June’s Counterparty Newsletter is full of updates from the Counterparty community. Check out a few of them below! Spells of Genesis released a new version of their game recently on Android and iOS platforms. Version 1.2.16 was not only updated to follow important GDPR (European General Data Protection regulations) protocol but featured significant updates to scale gameplay optimization. The first feature in the new update included previously roadmapped daily rewards. As mentioned in a previous newsletter, players are rewarded for each consecutive day they log on to the game. However, the value of the reward decreases if this pattern is broken. Players will also notice that when purchasing a card in-game that they will also be able to view the rarity chances of the card; noting the scarcity aspect of blockchain items and the recent ‘blockchainization’ feature within Spells of Genesis itself. The update also includes a more open challenge mode to allow easier access to Spells of Genesis’ monthly campaigns and one-day flash sales available through social media for 180 gems! The Spells of Genesis team also recently tweeted out a link to their community roadmap wherein lots of comments and suggestions have been added. Members of the community can add their own suggestions and/or upvote via this link. IndieSquare follows on from last month by confirming that they will release the previously mentioned, ‘WebXCP’ standard wallet this month. The wallet is designed to allow 3rd party developers to create web applications and XCP apps to be used on a mobile platform. You can learn more about SaruTobi Island here. Age of Rust recently released a development update for their 3D blockchain-based adventure game. The update focuses mainly on the prototyping that takes place throughout the game’s development and importantly, how it plays a part in the game’s world-building. With a real-world equivalent of 650,000 square meters to explore, the community can already explore Age of Rust via their beta version now! Augmentors provided their community with an update this past month on how their in-game currencies work. The Databits Economy – to which this update refers – stills runs off of the counterparty protocol, whereas previous updates have referred to other aspects of the game moving to the Ethereum blockchain. In this update, the Augmentors team provide a useful and illustrative backdrop as to how to obtain and apply their premium in-game currency Emeralds from Fiat in-game; as well as use their secondary currency ‘Gold’. The Augementor’s Roadmap has been updated to reflect these recent transitions. Via their social media networks, the Augmentors team reminded their community that their Alpha begins in 2 months. FoldingCoin has high expectations to progress more rapidly as the year moves forward with the recent full-time commitment of two of their team members; Bill Beard and Miguel Molina. These transitions should also bring about new product releases according to FoldingCoin’s founder Robert Ross; with a new release going live in early Q3. A FoldingCoin promotional video is also scheduled to be released this month. The FoldingCoin team would also like to warn their community about the numerous scam accounts on social media posing as FoldingCoin in order to obtain access to your money. As twitter verification is still not available please remain cautious. Mafia wars recently announced that their token sale began this month (June 1st). The project – a mafia-themed, blockchain-based, game of accumulation – has recently taken part in an airdrop, wherein counterparty community members were provided with 10% of each family token and 1% of the MAFIACASH supply for the Alpha game site that went live on May 15th. Mafia Wars was also interviewed for Cryptobit Games. To learn more about the game and the inspiration behind it, check it out here. Bitcrystals recently announced their support for a BitCrystals based airdrop from the Parsec Frontiers team that ended on May 31st. Parsec is a multiplayer online game based on the Ethereum blockchain but Bitcrystals holders taking part in the airdrop were offered PREPARSEC; a counterparty token in proportion to the number of BitCrystals that they held. In other news, a new card has recently been added to the BitCrystals CrystalsCraft collection via Book of Orbs. Bitcorn Crops was recently represented this past month at Blockchain Gamer Connects; a Blockchain Games Event in San Francisco, wherein the idea of cross-promotion with other projects such as Spells of Genesis and Age of Chains to name a few, were discussed. In more news, Bitcorn Crops recently broke past 50 user-generated cards within two months. This action has seen the origin of other Bitcorn based games such as Bitcorn Battle and other accumulation games within the counterparty community. If you’d like to learn more about Bitcorn Crops’ premise and any upcoming events in the community, you can check out an interview they did with Cryptobit games here. In a piece to prep the BitCrystal’s community for May’s Crypto Game’s conference, the team released an article entitled ‘Blockchainers and gamers bring value to games’. In the piece, the team discusses the key lessons EverdreamSoft founder (and BitCrystal’s parent) Shaban Shaame, has learned during his time in blockchain game development. Mentioning various blockchains and the recent discussion on rare digital art, the article is a quick but interesting read. In another article, the team provides a tutorial for another part of their ecosystem; Book of Orbs. In promotion for their web application (it is important to note that this is now the recommended platform for users to use), the article acts as a helpful guide to help users buy a card via the app. Check it out here. BitCrystals was also mentioned in a survey-based article on Venture Beat wherein the topic of Crypto-based gaming was discussed. Age of Rust was listed as one of the top 5 blockchain based video games of 2018 despite the fact it is yet to be released. In an article from Dan Anderson, the counterparty community is provided with a helpful and concise tutorial on how to fully utilize the counterparty protocol when trading, buying and issuing assets. With useful hyperlinks to help you find whatever you need throughout the piece, this is a great article to keep on hand for those still new to the community. Check it out here. In other news, the Ethereum blockchain size has exceeded 1tb. To break this down, issues occur – as the article illustrates – due to the required synchronicity from the Ethereum network. A question arises when the size and scalability of the Ethereum network start to task the capability of the systems in its network. To read more, check out the piece here. Counterparty understands the on-going frustrations regarding development and CIPs, we ask that you stay up to date with our social networks regarding these matters. Notes for a meeting Dan Anderson recently held for interested developers to attend can be found here. CIP 10 and CIP 6 are still subject to peer review and unfortunately, have no ETA. There is no ETA at this time for CIP 15 (segwit) but things should be moving forward given the above pledges – though it is welcome for review. You can stay up to date with current and future CIPs, as well as links to relevant GitHub pages via the Counterparty donate page. 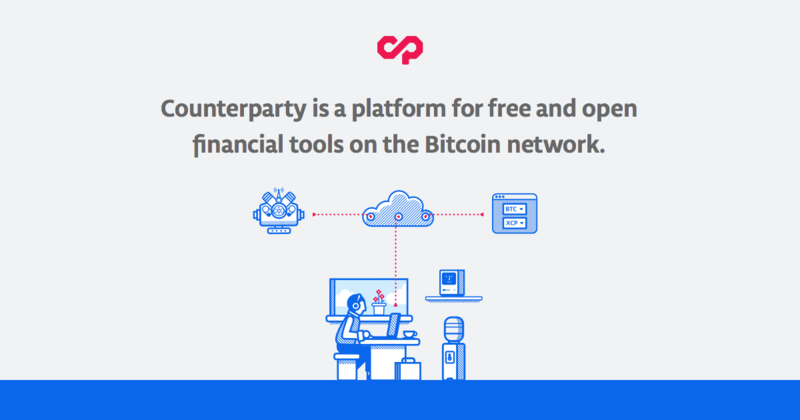 Counterparty hangouts are currently withheld until CIPs are next implemented, however, you can find our previous hangouts Counterparty.io shortly thereafter.